I've been busy lining up some fantastic new offerings that are going to be released through the newly minted Crucial Blaze series of limited-edition compact disc recordables that started out earlier in the summer with the full length Bleak from ghostly industrial droners Robe. 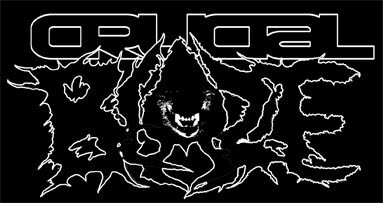 The second release in the series was just added this week (the debut four-song Ep from Wolfnuke, a gang of local blackened thrashers with, er, extremely close ties to Crucial Blast), and we have the following titles confirmed and in some stage of progress that you can look forward to. All of the discs will come in plastic dvd-style library cases with high quality artwork and presentation, insert materials, vinyl stickers, and 1" buttons, and most releases will be released in hand-numbered editions of 250 copies, with a select few released in smaller numbered runs. VOMIR Renonce CDR - a new, nearly hour-long wall of lightless oblivion from the French master of ego-immolating, pitch black HNW. Renonce will include a booklet of new writings from Vomir in the original French text, with English translations. SCHREI AUS STEIN Tsasnaasjini CDR - the second release from this excellent new blackened, blissed-out, cold-wave/dreampop project from Ross Hagen of Encomiast. CREMATION GROUNDS Abortion Sacrament 3" CDR - a very limited three-song/twenty-two minute set of brutal industrial noise, smoldering blackened HNW, and ultra-distorted black doom buried underneath endless layers of machine howl and feedback. Will include a chapbook of vile, surreal poetry influenced by the likes of James Havoc, Bataille, and Crowley. GLASS COFFIN CDR - a new disc of savage, malformed low-fi black filth from Josh Lay (Cadaver In Drag, Swamp Horse, Temple Of Rot, and assorted solo black/noise/drone works) that cracks skulls apart and then vomits black offal on the wreckage, part Archgoat/Beherit style primitive BM, part atavistic blackpunk violence. The package will also contain an art zine that will feature an array of Josh's demented and hallucinatory artwork and illustrations.